Vermont is one of the best places to vacation. Outdoor enthusiasts will be thrilled, as it is one of the largest but also least populated states in the US; foodies will be over the moon with Vermont’s amazing restaurants, farmers’ markets, as well as local producers; and wellness aficionados will be amazed with Vermont’s world-renowned spas and wide variety of fitness activities. In Vermont, you will find miles and miles of untouched lands, natural beauty, mountains, lakes, historic villages, an amazing food culture, incredible landscapes. Best of all, since Vermont’s natural beauty is just a short drive from Montreal, it makes it the perfect short-stay destination in every season. The picturesque village of Stowe is home to Vermont’s highest peak, Mount Mansfield, and offers a historic and vibrant community with all the charm of a traditional New England village. Since it’s a ski town, you will find a wide variety of ski resorts —such as the recently renovated Topnotch Resort, which used to be owned by Montrealers. 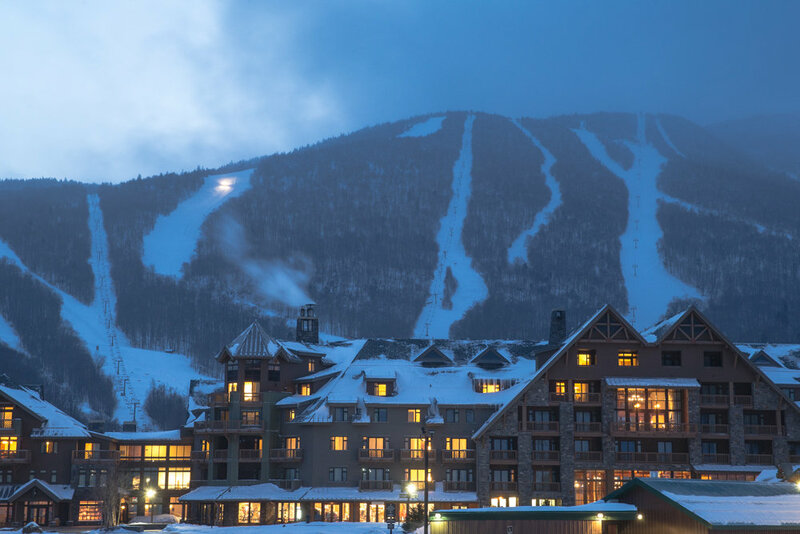 What differentiates the Topnotch Resort from other ski resorts in Stowe is that it’s more on the boutique side. With its design and 68 rooms, Topnotch is not your typical in/out ski lodging. Amenities and activities at this AAA Four-Diamond property include the 35,000-square-foot Topnotch Spa, a renowned Tennis Center with four indoor and six outdoor courts, a state-of-the-art Fitness Center with daily fitness classes and two outdoor pools with mountain views—one of which is heated year-round. 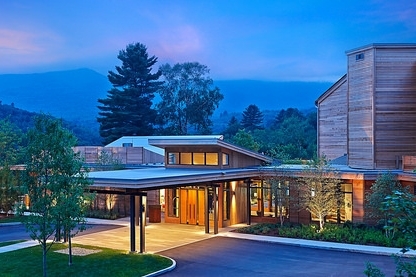 This is definitely where you want to spend your next Stowe getaway. On your first day, why not visit one of the most photographed covered bridges in Vermont (Emily’s Bridge) and explore the village centre. Afterwards, plan a visit to the infamous Ben & Jerry’s Factory, where it all began for the Vermont ice cream makers, and end up in the small town of Waterbury. In Waterbury’s national park you will find “The Reservoir,” the ninth-largest body of water in the state of Vermont. While in Waterbury, you must also dine at the original location of the highly-acclaimed restaurant Hen of the Wood. The following day, why not take the Gondola SkyRide to the top of Mt. Mansfield ?! The views are fantastic, even more so during the fall foliage season. You can take a steep hiking trail from the gondola to the very top of the mountain and end your day at the award-winning Topnotch Spa. The Couple’s Deluxe Session—a house specialty—begins by the fireplace, sipping tea and enjoying foot massages with your partner, followed by full-body massages. How delicious is that?Stowe is not just about the skiing, it’s about disconnecting, enjoying the great outdoors, breathing fresh air, taking it slow, and enjoying the moment. Burlington is the largest city in Vermont. However don’t be fooled: it’s also very convenient for a short stay, as everything that you want to see is located within walking distance. This dynamic college town is compact, beautiful, home to creative entrepreneurship, great shopping, a gorgeous waterfront public area and the vibrant Church Street Marketplace. On the first day, you must get acquainted with the town centre. On Church Street you will find a brick-paved pedestrian mall, historic buildings ranging in style from Victorian to Art Deco and, of course, Church Street Marketplace. Local shops and restaurants as well as cultural venues, outdoor cafes, street vendors, and entertainers keep things lively all day long in this public marketplace. 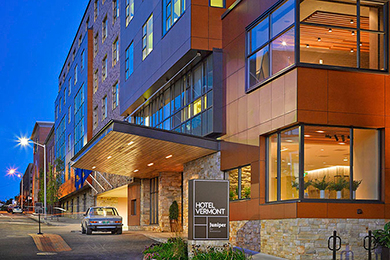 After a day of exploring, shopping and art-peeking (check out the Burlington Arts Center), check in at the stylish, locally designed Hotel Vermont, the only boutique hotel in the area. Modern yet rustic, this incredible property—located in the heart of the action—is the only place you’ll want to stay during your Burlington escape. All public spaces and rooms are “Vermont-inspired”: a lobby living room with fireplace, the excellent Juniper Restaurant/Bar, an outdoor terrace, and a green roof. This hotel will make you feel like a local without ever compromising your comfort. At night, why not try the second location of the Hen of the Wood restaurant, which recently opened on the Hotel Vermont premises, then call it a night with trivia games near the lobby fireplace? In the morning, a short walk from the hotel will take you to one of the best bakeries in the country, August First, while a brand-new coffee tasting bar, Onyx Tonics (located nearby), will please all the coffee geeks. Vermont is a foodie state, known for its coffee, cheese, beer, ice cream, and chocolate; this is your chance to explore! 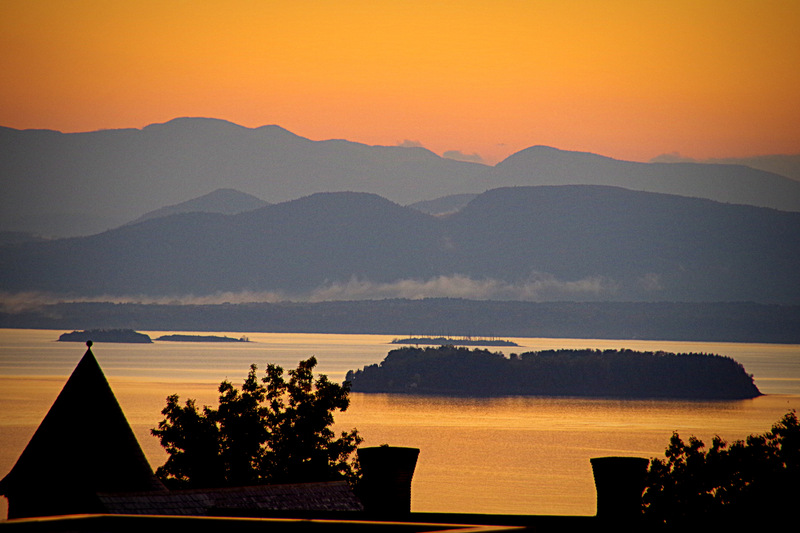 After a quick bite, head to the nearby waterfront where you will find lakeside parks, a gorgeous boardwalk, and a 12.5 mile walking/bike path that connects to the Lake Champlain. Bicycles, rollerblades, kayaks, and sailboats are all available for rent to better experience the views across the spectacular lake. On the way back home, you have to stop at one of the many Burlington-area farms & markets to pick and choose your own fruits and vegetables and see what Vermont is all about: food and friends, both authentic and inspiring.